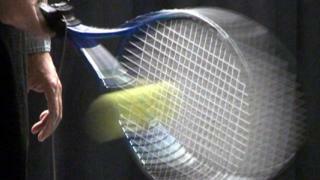 Tennis elbow could be avoided by reducing the tension on racquet strings, according to Dundee University researchers. The condition may have eluded Andy Murray in his career to date, but it affects almost half of all tennis players in their lifetimes. The team found increasing string tension placed greater load on the elbow, increasing the risk of injury. Tennis elbow is caused by the overuse of the muscles attached to the elbow. Prof Rami Abboud and his team at the university's Institute of Motion Analysis and Research studied the forces placed on the elbows of 20 tennis players while they executed simulated backhand strokes. Prof Abboud said: "It's not only related to tennis, it affects many other professionals. "The idea came to research it because it has affected my wife, who doesn't play tennis, but affected her day-to-day job as a surgeon. "Tennis elbow, or lateral epicondylitis, is a common injury for tennis players and one that, while it can appear relatively benign, can lead to significant pain long after people have stopped playing." Media captionNew research suggests tightly strung racquets could increase the risk of tennis elbow. The professor said his team found a "clear relationship" between varying string tension and the force placed on the elbow. He said: "The tighter the strings then the greater loading we found on the elbow. "There are a number of factors, which we are currently exploring, that can place strain on the elbow and contribute to lateral epicondylitis but our findings suggest that racquet tension is a significant one. "In tennis players with a predilection for developing tennis elbow, reducing the racquet tension should be considered to help reduce the risk of injury."